RESERVE YOUR LIFESTYLE STRATEGY SESSION WITH ANNIE HERE! Here's 30 minutes of time with me to help find a way from where you are to where you want to be! 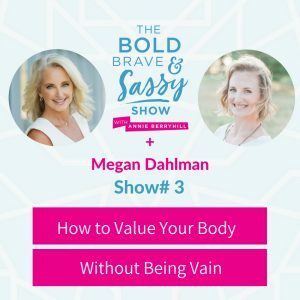 Listen as Annie and Megan Dahlman, founder and owner of Strong Mammas, exchange stories about pursuing healthy lifestyles and their efforts toward helping others do the same. Discover some insights to help you unlock success in your own fitness and nutrition goals through the expertise and experiences they share. Megan Dahlman is the founder and owner of Strong Mammas, an online fitness and nutrition program that gives you all the tools necessary to feel better, get healthier and stronger, and connect with a supportive community. She’s an expert in healthy living who specializes in helping moms pursue a better life through fitness—minus the vanity and obsession. Megan has always loved fitness. In high school, she discovered satisfaction in learning how to sculpt her body through the use of various exercises and training. In college, she continued on this fitness path and participated in many endurance sports. Eventually, this led her to pursue a degree in Exercise Science. But as she became a mom for the first time, she realized that this fitness pursuit often had some baggage attached to it that she wanted to get rid of. So she began her own online community for moms with the desire to rid nutrition and fitness of the vanity and obsession that often accompany it. Lower the bar when you first begin a new fitness and nutrition goal. Many times when setting new goals we set the bar too high and set ourselves up for failure. Avoid this trap by lowering the bar when setting goals. Find a plan that you can maintain absolutely. Eat your pros (protein and vegetables). Whenever you have a meal, put something on your plate that’s protein, and something on your plate that is produce. Those are your “PROS”. Just start there. Life happens, food happens—avoid the all or nothing mentality. By realizing that you’re just one meal away from being back on track, you eliminate the guilt and avoid derailing your efforts. Create awareness of what you’re consuming. 95% of what we do is habit based. We need to become aware and make intentional decisions based on our goals—not our habits.